shot by contemporary photographer, Ian Cameron, "peacock feathers" is an innovative take on landscape photography. Cameron spent a lot of time in Scotland photographing breathtaking vistas during very harsh weather. this particular image was captured in Applecross, Highlands, Scotland. 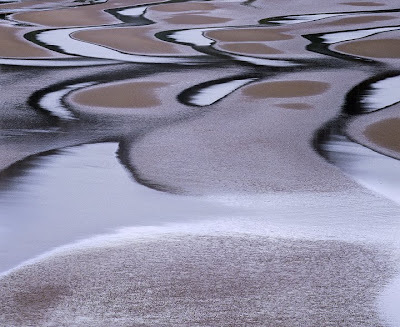 "The scallop shaped depressions are large undulations in the red sand beach and the black scallop shapes are distorted reflections of the silhouetted hills on the far side of the bay." explains Cameron. this shot caught my attention more than the others because it has one of the photographer's signature traits, which is capturing a view that could be interpreted as something else. the depressions on the beach look like peacock feathers rather than just plain sand. his point of view makes landscape photography more interesting to me. You have given a nice explanation of what is innovative in this photograph.